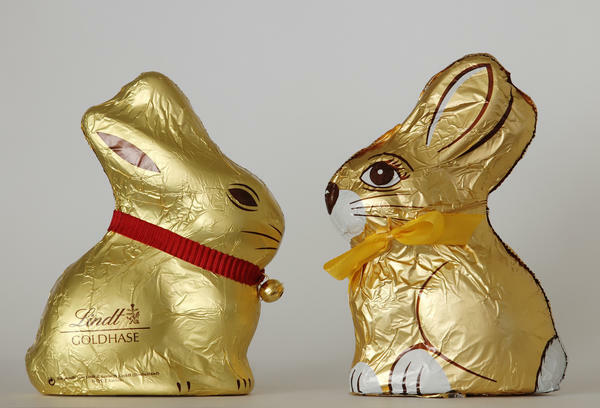 Chocolate Easter bunnies by Swiss company Lindt, left, and Austrain company Hauswirth, which agreed to stop making chocolate Easter bunnies that look like those made by Lindt & Spruengli in 2012. "The case in Germany's highest administrative court was the fourth and final one Lindt lost in its attempt to win copyright protection of its Easter bunny model. The court had to answer whether it was legally possible to register a product, which was in general use for decades, as a trademark, said Daniel Terheggen, Riegelein's lawyer from Lindner & Blaumeier Attorneys. "'The ruling has set a legal precedent in copyright law with which we are very satisfied,' he added. "Confiserie Riegelein was the only defendant left to face up to Lindt in the courts, after a number of smaller chocolate-making firms succumbed to the pressure exerted by the Swiss giant." Of course Riegelein was very happy. "The sitting gold-wrapped bunny has been a firm part of our offering for at least a half century," Peter Riegelein said, according to The Guardian. "Now it is finally clear that it can stay as it is." Lindt hinted the fight was not over. "We will continue to defend our Lindt gold bunny in the future whenever necessary," the company said in a statement.